Life is just one big game of laser tag with Father.io. 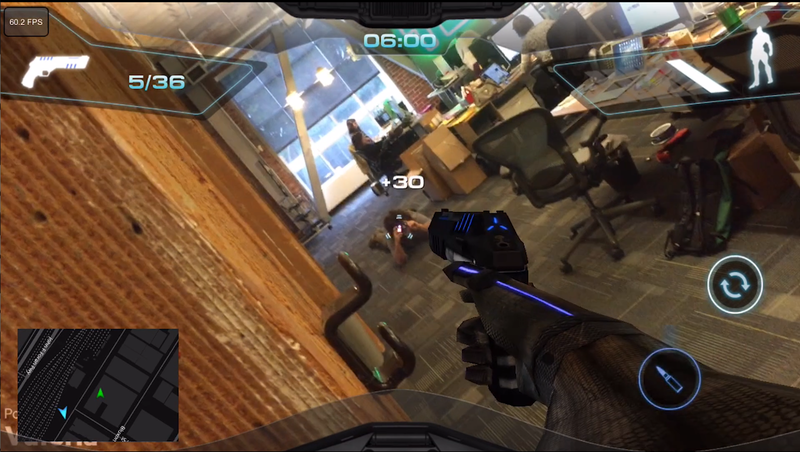 I got a chance to play with an early prototype of the company’s Inceptor smartphone dongle and its augmented reality massive multiplayer first-person shooter app. It was a blast. The company is launching on Indiegogo today, aiming to raise $50,000. Check out the video above to see Tito and myself annoy the hell out of everyone in the TechCrunch office while playing Father.io. Look past the fun potential for games of high-tech laser tag with your buddies and you’ll see that Father.io actually has massive ambitions to create an augmented reality massive online multiplayer first-person shooter. The Indiegogo campaign sets the stage for a dark future led by an evil force that I’m 99% sure is Amazon’s Alexa. Despite tons of hype for the promises of gaming in the virtual reality space, the technical difficulties inherent to, well, reality have left interest for augmented reality gaming on the back burner. Father.io is certainly ambitious. The game is aiming to be a major cross-platform AR experience with users being able to utilize smartphones, smartwatches, computers and even freaking drones to play. What is perhaps the most exciting part of this is that it’s crazy cheap to get in on the action. The smartphone add-ons, called Inceptors, start at just $18 for early backers. The devices should begin shipping by the end of summer according to the company’s estimates. In addition to the IR gadgets allowing you to take shots on nearby players, they also serve to alert you of “enemies” when they enter your immediate area so you can be ready to take them on. Whether you’re buying in on Father.io for the promise of high-tech games of laser tag with your friends or you are truly devoting yourself to taking on “Ethereus,” this unique take on augmented reality gaming is definitely something fascinating and fun to experience.